Have you ever noticed that “France” is called by several different names? Learn the various synonyms and the exact meanings of each one. France is the most common, general term and indicates the entire country, including the DOM-TOM (see below). “The Republic,” the most patriotic term, refers to France by way of its republican constitution. Variation: la République française is the official name of the country and is commonly abbreviated as RF. The nickname “Hexagon” refers to the shape of the mainland’s borders and so does not include the DOM-TOM, though curiously it does include Corsica. “Metropolis,” synonymous with l’Hexagone. This is the term inhabitants of the DOM-TOM tend to use when referring to the mainland. “Metropolitan France,” synonymous with la Métropole and l’Hexagone. “Continental France” indicates just the actual hexagon: metropolitan France minus Corsica. “Deep France” refers to rural France: the villages and provincial life found outside of the cities. 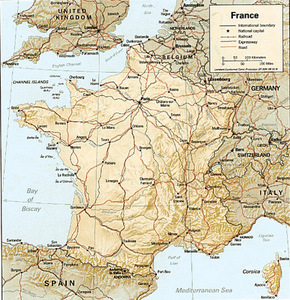 la Gaule is the French version of Gallia, the original Latin name of the area that includes present-day France; Luxembourg; Belgium; most of Switzerland; and parts of Italy, Germany, and the Netherlands. The name changed to Francia in the Middle Ages. The term la Gaule doesn’t refer to modern France, but its adjective gaulois is sometimes employed for historical or humorous effect. *It should be DOM-ROM-TOM-COM or DROM-TOM-COM. The “R” stands for région, as all of the départements d’outre-mer are also régions d’outre-mer.